Some ethnic dining this week, with the Alter Wirt whose website claims it is a Bayerisches Gasthaus Mit Biergarten und Zimmervermietung, again translated as a Bavarian Guest House and Beer Garden. Bavarians are an interesting group of people. They have traditionally been proud of their culture, which includes festivals such as Oktoberfest, the world’s largest beer festival, and elements of Alpine symbolism. The state also has the second largest economy among the German states by GDP figures, giving it a status as a rather wealthy German region. Entrance through the beer garden. Bavarians are the world’s most beer-loving people with an average annual consumption of 170 liters per person, and Oktoberfest, which welcomes around six million visitors every year in the famous beer gardens, some trying to exceed 170 liters in one sitting. And in case you had forgotten, neurologist Alois Alzheimer was a Bavarian! Alter Wirt, on the other hand, is easy to find. It is on Soi Khao Noi (coming from Sukhumvit) past Soi 9 and on the left before Murphy’s Pub. It is in a single shophouse, but the blue and white Bavarian colors make the place obvious. It is in two sections, with the external (smoking) area outside and covered, and the interior with another four table settings and fans. In line with the Bavarian love of beers, there are about 10 listed in the menu, and various posters on the walls. Local beers are B. 60-80. I began with a Warsteiner Pils, one of my favorite drops, but then moved on to the Erdinger Alkoholfrei, a full-taste full-bodied beer with zero alcohol! Ideal for the designated driver. Along with the beer came a plate of sliced radish, with its lovely little bite. House wines are from New Zealand and Australia and are B. 89 for a 200 ml glass to B. 169 for a 400 ml measure. Soft drinks and fruit shakes are available too (B. 35-99). The menu is not extensive, but also not expensive. A hamburger, for example, is B. 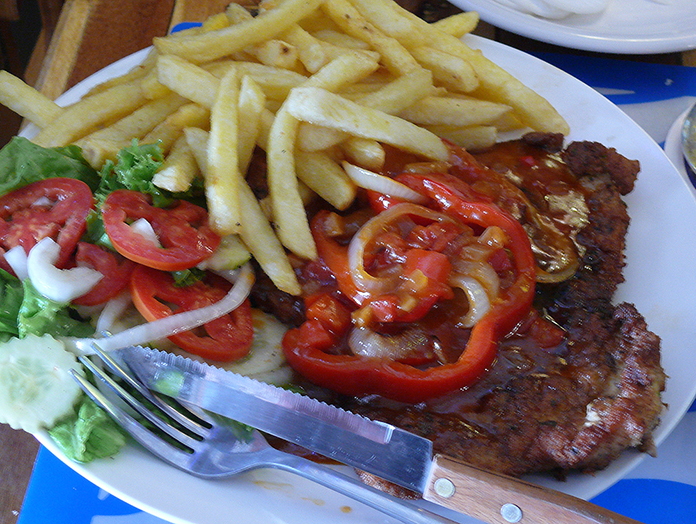 99, at the lower end, whilst the most expensive dish is a 250 gm rib-eye steak at B. 239, which of course comes with fries and salad. 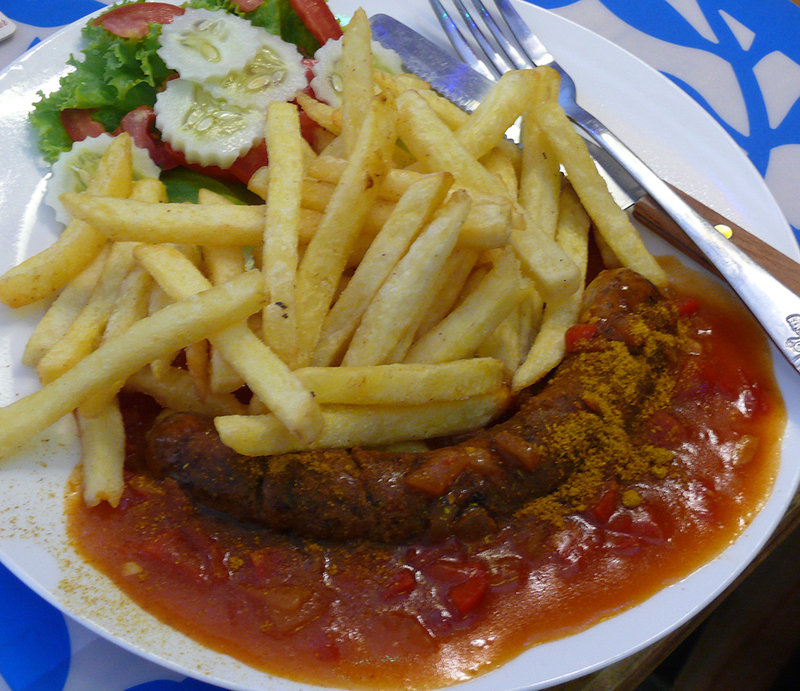 Others in the list of 14 main dishes are a Curry Wurst (B. 129) and other sausage favorites around B. 149. A 250 gm pork chop is B. 159, or the roast pork at B. 199. In the specials, Alter Wirt offers a Giant Schnitzel 320 gm at B. 249 or a 520 gm for B 399 and the ‘Monster’ 1 kg for B. 599. That is certainly some appetite. Our meals were brought to the tables, along with some bread and home made chilli butter. With one mouthful, I could see why the Curry Wurst was one of the most popular dishes. A beautifully cooked sausage with a great curry sauce. And I have to admit I couldn’t get through it all, there was still a mountain of fries on the plate when I gave up. A very large plate of schnitzel. Madame was in the same situation, and unable to finish hers either, but loved the dish. So there you have it, miss the meal before to build up the hunger, or have a large appetite. You’ll need it. We did not have room for desserts, but were talked into a schnapps and the lemon was fabulous. Do have one. Alter Wirt is an amusing little restaurant. True to its Bavarian roots, with huge portions and plenty of sausages. And also very inexpensive. A restaurant to cater for you and a bunch of your friends. We really enjoyed it. 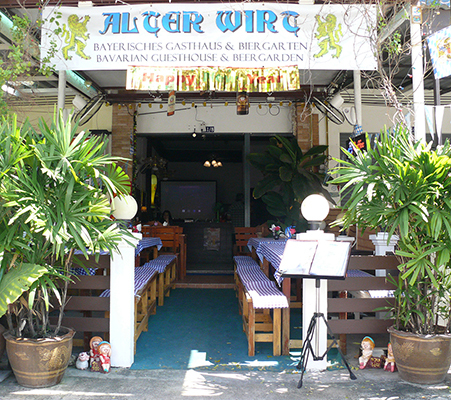 Alter Wirt, 141/8 Moo10, Soi Khao Noi (Boonsamphan), lunch 12 noon – 2 p.m., dinner 4 p.m. – 10 p.m. closed Wednesday, tel. 097 121 7478, plenty of on-street and off-street parking.